Upon reading the essay, I was immediately transported to the awe that I felt in 1995 upon witnessing my first Torovenado in Masaya, Nicaragua. Throughout my life I had only visited Nicaragua during the summer and I had enjoyed the initial celebrations of the three month festivities for San Jeronimo, the patron saint of my mom’s hometown – Masaya. El Torovenado – a satirical procession occurs at the end of the celebrations – the final Sunday of October. In 1995, I moved to Nicaragua for an extended period and the uncle with whom I was living, invited to take me to El Torovenado. Mi Tio Jorge enjoys a good party and is not particularly religious, so I was a little surprised that he’d want to go to the culmination of a saint’s festivities. However, I noted a mischievous spark in his eye and I agreed to join him on the 20 minute drive to Masaya. I was dumbfounded upon seeing a giant gay parade in my mom’s hometown. It was as if the San Francisco Castro that I grew up with had transported itself to Masaya. There, before me, was the Lion’s Club (El Club de Leones) Queen – queen of the parade – a proper queen, entirely in beautiful drag. Everywhere I looked the rainbow flag was flying high. I think my uncle truly enjoyed at how speechless I was. The culmination of this Catholic festivity had been co-opted by the gay community and everyone appeared to be fine with it. Since El Torovenado is a satirical procession in which people are allowed to mock anything and everyone – from historical figures to the most powerful political figures, in retrospect, it makes sense that the gay community took over this particular day of celebration; after all it’s a day of freedom, when social norms are discarded. El Torovenado is alternately called La Parada de los Cochones. In relation to the gay Dominicans featured in “Tacit Subjects,” these are people (primarily men) who are out and proud and the public persona that they present particularly in a festive procession may be very different than who they are with their family. Perhaps the acceptance of the gay community in Nicaragua allows young people to come out and discuss sexuality more openly than in the DR and it is not such a tacit subject. However, macho culture exists as in the rest of Latin America and I would not be surprised if a large portion of this community is alienated from their birth families and have constructed or adopted new families based on their sexuality. according to Erick Blandon, the Torovenado is a ‘moment of escape from oppressive heterosexual masculinity and a dialogic engagement between different sexual subjects where homoeroticism becomes the center of attention for both homosexuals and heterosexuals.’ While transvestics are not the quotidian norm in Nicaragua, it is clear that the country has had a public and symbolic space for these kinds of gendered performances. With the current violence and repression by the Ortega dictatorship, I wonder how the LGBTQ community is doing. Have they become a tacit community? Are they remaining in-doors as does the majority of the population come nightfall? The LGBTQ Nicaraguan population has largely thrived due to the safety and acceptance of the country, but with assassins trolling the streets, freedom and expressiveness may no longer be available. It is so sad that the military leaders will allow a single couple – Ortega and Murillo hold an entire country hostage and have destroyed the legacy of a popular revolution. 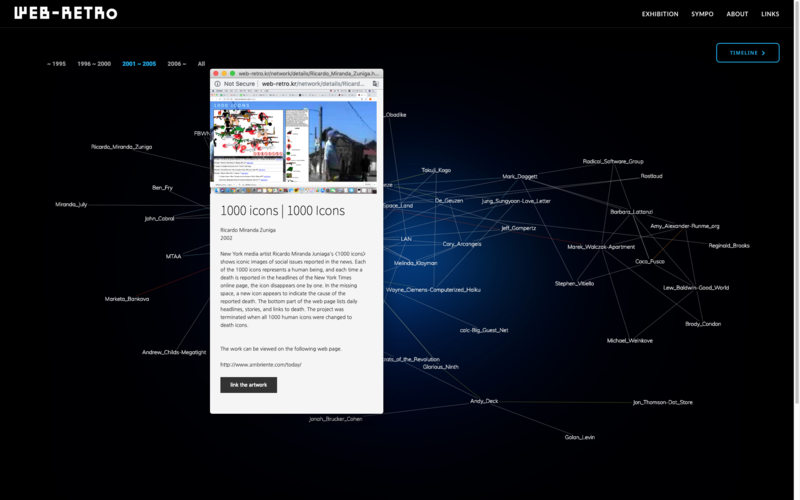 Included in the exhibition is the net.art visualization 1000 icons. From June 15th to August 25th 2002, one human icon (of a thousand) disappeared for each death reported in the headlines of the New York Times Online. The human icon was replaced by a new icon representing how the reported death(s) occurred. Upon consuming the NY Times headlines, I would illustrate an icon based on any deaths covered amongst the top headlines. If the death(s) occurred due to an act of aggression, the new icon was accompanied by a flag or emblem representing the nation or organization claiming responsibility. Below the icons are listed each day’s death NY Times headline(s). This project came about due to the Second Intifada – an intensified period of Israeli-Palestinian violence and the citing of daily death in news headlines.